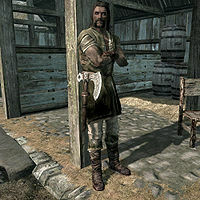 Skulvar Sable-Hilt, a Nord warrior, is the ostler who runs the stables outside the city of Whiterun. He lives there with his son Jervar and will sell you a horse for 1000 gold. Skulvar dedicates much of his time to maintaining the stables and serving any potential customers. He wakes up at 8am and immediately leaves the stables building to head outside. He will head to the horses' stable and will stand around in this area or sit down in a nearby chair, awaiting any potential buyers. He will stay outside for the next twelve hours, until he heads back inside the stables building at 8pm. After a long day of running the stables, he will relax inside the building for the next four hours until he heads to bed at midnight. He wears farm clothes, gloves, and boots. He carries a key to the stables as well as a selection of common items and gold. He wields an iron war axe. When you approach him, he will not hesitate to promote his business, saying, "Got the fleetest steeds in all o' Skyrim. ", "Gal/Man like you needs a warhorse, I reckon. ", "Only thing better than ridin' a swift horse is ridin' a swift horse over the enemy." or "Lookin' to shatter records or bones? My beasts can do both." When asked about the age of his horses, he will say: "None of 'em's older than nine, and the youngest is six. Now, the horse I got for sale is seven years old, but in fine health. She's got a lot of spirit, that one. We've taken to calling her Queen Alfsigr, or just Allie for short. I expect you can name her anything you like once she's yours." If you just exit conversation without buying anything he will say, "Ride strong." If you buy a horse from him, he will bid you farewell with, "You always keep us in mind when you need a fresh horse, yeah?" Lillith: "Everyone is [sic] this city is so on edge. I could use some good news, Skulvar." Skulvar: "Ha! Four more geldings sold. Sound like good news to you?" Lillith: "Indeed. I do hate to admit it, but if nothing else, all the fighting lately has been a complete blessing to this business." Skulvar: "Aye, that it has. Trust me, mum - once you've killed a man from a horse, you'll never want to fight on the ground again. Ain't no goin' back." Lillith: "Why thank you for that most colorful assessment, Skulvar. So we'll be needing fresh horses, then?" Skulvar: "Aye, mum. That we will. Mares, stallions, donkeys - I don't think it matters. Pretty sure I can sell any steeds we get." Lillith: "Excellent. I'll send the proper letters, then, and have some fresh horses delivered straightaway." Skulvar: "Lookin' forward to it." If Skulvar dies for any reason, his son Jervar will sell you a horse in his place. This page was last modified on 16 May 2017, at 18:23.